Let’s face it, upkeep is a chore and nobody enjoys doing it. But like brushing your teeth and servicing your car, very few people have a choice in the matter when they have strong yet heavily used appliances at home. Garage door maintenance is no exception to this rule. The first step to ensuring that you won’t need major repairs any time soon is to ensure that the parts and components are properly protected from any elements that could tarnish them. For instance, ensure that the doors themselves are coated with a protective agent such as paint or varnish. Galvanic corrosion can pose a significant threat to the metallic parts in your system, as will rust, so keep a close eye on each part to ensure that it isn’t aging rapidly. You should carry out regular lubrication maintenance to ensure that friction doesn’t wear down your moving parts and that every element in your system is secured properly in place. It's also wise to keep your garage door clean enough so that nothing obstructs the tracks. Components under considerable stress such as the springs, safety cable, and bearings should be watched closely for signs of stress or cracking. These essential functionality and safety components should always be replaced before they break if it can be helped. This will help to assure that your system poses no danger, and doesn't risk becoming imbalanced, which could hamper its health and performance. Accidents do happen from time to time, and when they involve your garage door, there could be serious ramifications for your safety as well as overall system health. So if your door gets damaged, you'll want to get it repaired as soon as possible. For this reason, it's a good idea to find a local technician that you can rely on to take a look before the damage worsens. Could Your Garage Door Be Smarter? We’ve been helping customers with their door problems for more than a decade. When providing a service, we focus on your safety, security and convenience at all times, and will make sure you’re completely satisfied with our work. Contact us to schedule an appointment or explore our website for more detail. 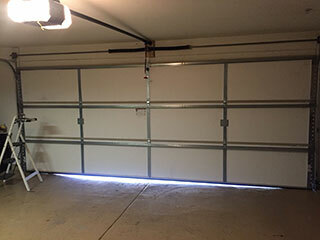 With Garage Door Repair Ashland, your satisfaction is always guaranteed. Count on us for high quality, speed, and honesty on every job. Our technician will contact you before arriving. Until then, feel free to browse our website! Garage Door Repair Ashland is at your service!